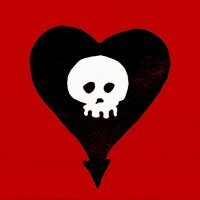 Alkaline Trio postpone UK leg (sorry) of 2011 tour due to accident! Autumn must be the season for coming a cropper or becoming crook with the lurgee. Adele (and what seems like the entire singing fraternity) is out of action with her throat, Rihanna's caught some Scandinavian virus recently, while Jesus Jones' Al Doughty cricked his ankle at home and John Foxx bumped his head badly, all resulting in hospital visits or higher insurance premiums, not forgetting cancelled shows. Hey, sh*t happens, they're only human. Joining the list of casualties is Alkaline Trio frontman, Matt Skiba, whose leg became entangled in a physical row with a truck. In other words, it ran the poor sod over. He's OK, his leg's sore but he can't stand up on it, which means the guys can't make it for their upcoming UK jaunt. According to Matt's Twitter postings; "It's official: closed fracture of the malleolus (ankle bone) and a fractured metatarsal. On crutches/in a cast. My sincerest apologies to all our fans in the UK and in Germany. Once I'm healed we'll be back to play for you guys as soon as we can. " There is some good news - the band are clearly keen for coming back over when the weather's brighter and Matt's leg has healed, because the Exeter show, due to be played on 6th November (Sunday), has been rescheduled already for 24th April - huzzah! Tickets are on sale now, priced at £16.50 - but the advice is, if you have original tickets, keep 'em tightly-gripped because they'll be needed for the shows next year. We say, get well soon Matt! All of the dates have now been rescheduled and the tour will now take place in May 2012, starting with a brand new date in Portsmouth on 1st at the Pyramid Centre, before moving onto the rescheduled dates. See below for the full list of dates and tickets.